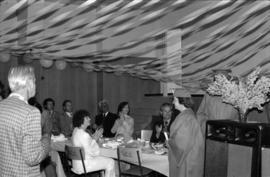 Photograph depicts class of 1978 graduates receiving diplomas at the Queen Charlotte Secondary School graduation ceremony. 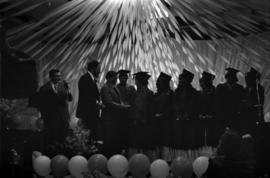 Photograph depicts Iona Campagnolo and others applauding the class of 1978 graduates at the Queen Charlotte Secondary School graduation ceremony. 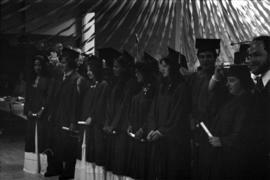 Photograph depicts the class of 1978 graduates with diplomas at the Queen Charlotte Secondary School graduation ceremony. 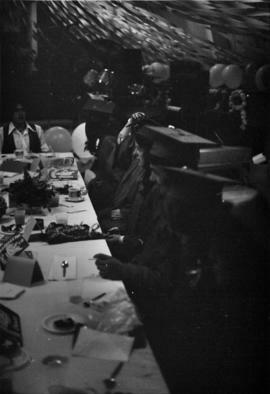 Photograph depicts a table of seated graduates at the Queen Charlotte Secondary School graduation ceremony in Queen Charlotte City. 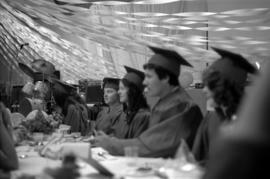 Photograph depicts a table of seated graduates by a drum set at the Queen Charlotte Secondary School graduation ceremony in Queen Charlotte City. 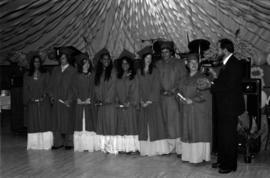 Photograph depicts graduates speaking from the podium at the Queen Charlotte Secondary School graduation ceremony in Queen Charlotte City. 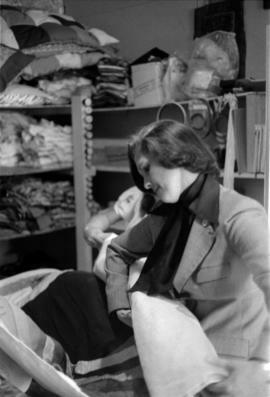 Photograph depicts Iona Campagnolo and a young woman examining and folding a quilt tapestry from the Queen Charlotte City recycling project grant funded by Project Mobilization Canada Works. 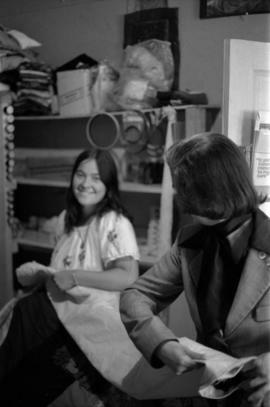 Photograph depicts Iona Campagnolo and a young woman folding a quilt tapestry from the Queen Charlotte City recycling project grant funded by Project Mobilization Canada Works. 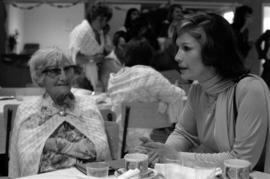 Photograph depicts Iona Campagnolo in conversation with hand on table while sitting next to Mrs. Debussy at the class of 1978 Queen Charlotte Secondary School graduation ceremony. 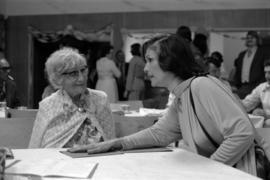 Photograph depicts Iona Campagnolo in conversation while sitting next to Mrs. Debussy at the class of 1978 Queen Charlotte Secondary School graduation ceremony. 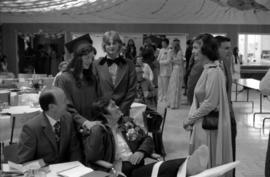 Photograph depicts Iona Campagnolo meeting the family of a graduate at the class of 1978 Queen Charlotte Secondary School graduation ceremony. 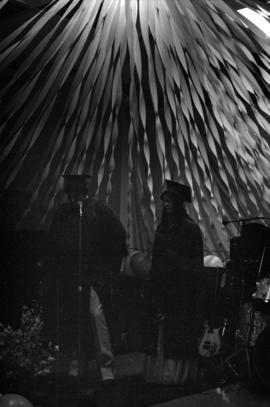 Photograph depicts Iona Campagnolo shaking hands with a female First Nations graduate and an unknown young man at the class of 1978 Queen Charlotte Secondary School graduation ceremony. 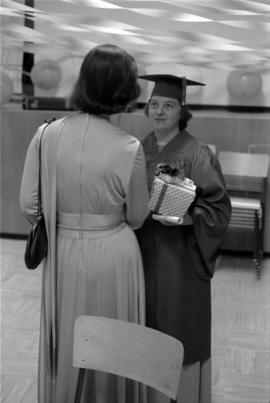 Photograph depicts Iona Campagnolo shaking hands with a female graduate at the class of 1978 Queen Charlotte Secondary School graduation ceremony. 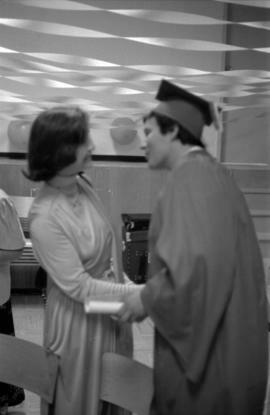 Photograph depicts Iona Campagnolo shaking hands with a male graduate at the class of 1978 Queen Charlotte Secondary School graduation ceremony. 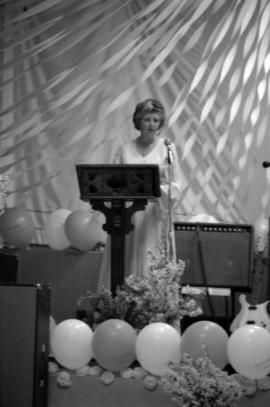 Photograph depicts Iona Campagnolo addressing graduates to her right from a podium with microphone at the Queen Charlotte Secondary School graduation ceremony in Queen Charlotte City. 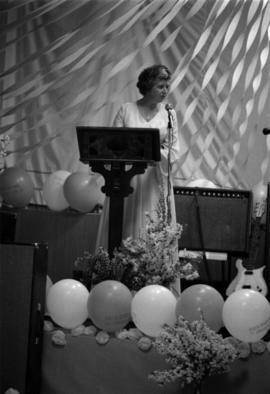 Photograph depicts Iona Campagnolo addressing graduates from a podium with microphone at the Queen Charlotte Secondary School graduation ceremony in Queen Charlotte City. 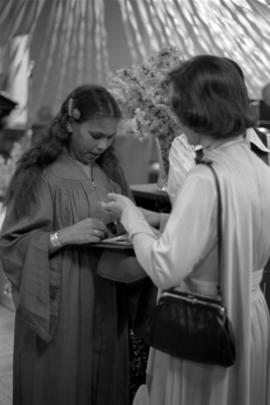 Photograph depicts Iona Campagnolo speaking with an unknown female First Nations graduate at the class of 1978 Queen Charlotte Secondary School graduation ceremony. 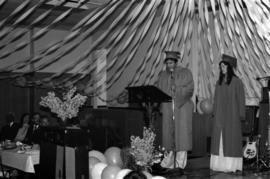 Photograph depicts Iona Campagnolo speaking with an unknown female First Nations graduate and an unknown young man at the class of 1978 Queen Charlotte Secondary School graduation ceremony. 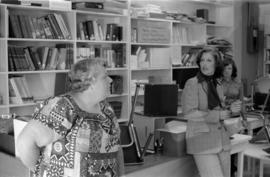 Photograph depicts Iona Campagnolo with staff members at the Queen Charlotte City Library circulation desk. 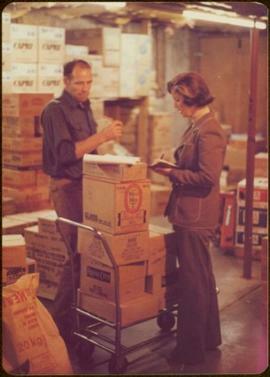 Handwritten annotation on verso reads: “Iona in Queen Charlotte City, August 1977”. 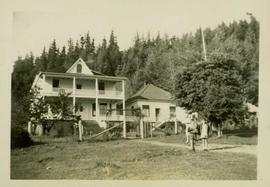 Two children and a woman stand in the front yard of the Queen Charlotte City Hospital and nurses home. 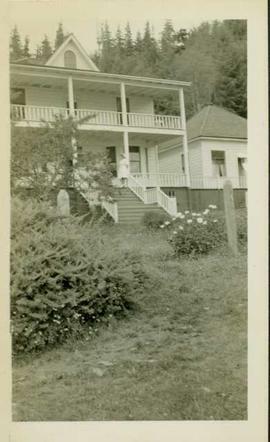 A nurse stands on the veranda of the Queen Charlotte City Hospital. 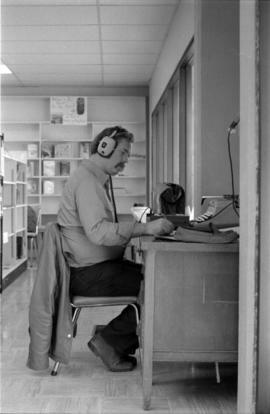 The nurses home is partially visible on the right hand side of the photograph. 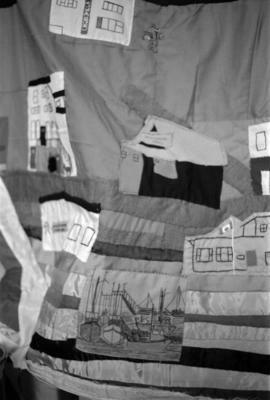 Quilt tapesetry entitled "Community Panorama"
Photograph depicts a close-up view of a quilt tapestry entitled "Community Panorama" from the Queen Charlotte City recycling project grant funded by Project Mobilization Canada Works. 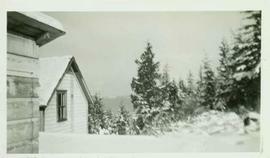 Partial buildings are visible amongst the snow topped trees. 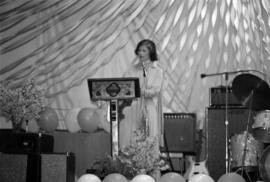 Mountains visible in the background. 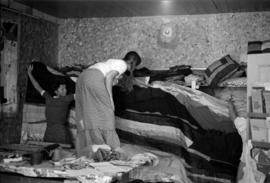 Handwritten annotation on verso reads: "Queen Charlotte Island Christmas 1946." 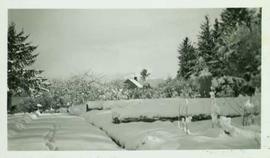 Snow covered buildings, hedges and boardwalk in Queen Charlotte City. 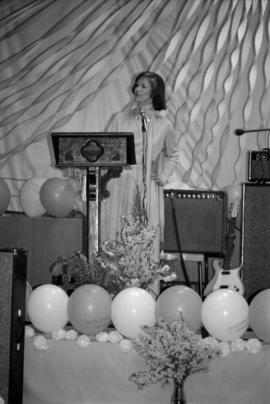 Handwritten annotation on verso reads: "Queen Charlotte Island Christmas 1946." 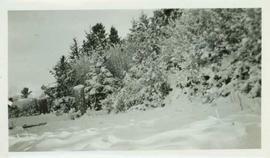 Snow covered landscape in Queen Charlotte City. 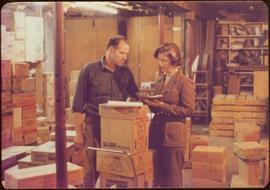 Handwritten annotation on verso reads: "Queen Charlotte Island Christmas 1946." 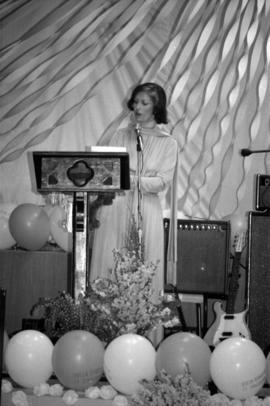 Photograph depicts an unknown woman addressing graduates to her left from a podium with microphone at the Queen Charlotte Secondary School graduation ceremony in Queen Charlotte City. 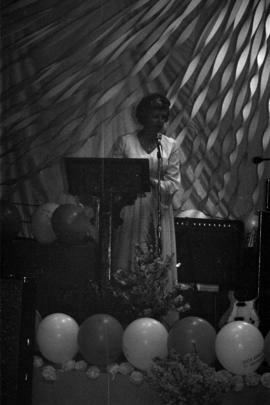 Photograph depicts an unknown woman addressing graduates from a podium with microphone at the Queen Charlotte Secondary School graduation ceremony in Queen Charlotte City. 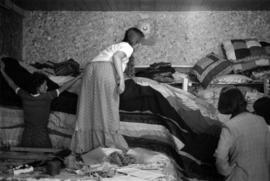 Photograph depicts a young woman holding up a quilt tapestry entitled "Community Panorama" from the Queen Charlotte City recycling project grant funded by Project Mobilization Canada Works. 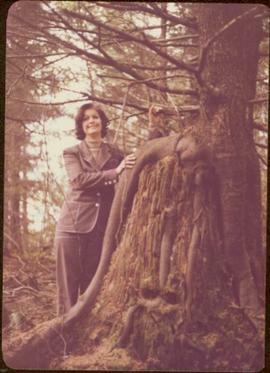 Young women holding up quilt entitled "Nature's Panorama"
Photograph depicts Iona Campagnolo and three young women holding up a quilt entitled "Nature's Panorama" from the Queen Charlotte City recycling project grant funded by Project Mobilization Canada Works. 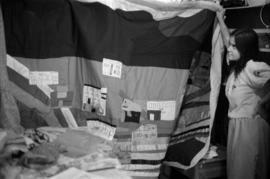 Young women holding up quilt tapesetry entitled "Community Panorama"
Photograph depicts a young women holding up a quilt entitled "Community Panorama" from the Queen Charlotte City recycling project grant funded by Project Mobilization Canada Works. 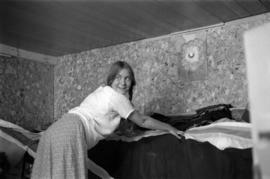 Young women holding up quilt tapestry entitled "Nature's Panorama"
Photograph depicts two young women holding up a quilt entitled "Nature's Panorama" from the Queen Charlotte City recycling project grant funded by Project Mobilization Canada Works.